Phil was diagnosed with chondrosarcoma in his left leg. Phil Youngren is a sweet, 81-year-young man who was diagnosed with chondrosarcoma in his left leg in May of 2013. For a couple of years, Phil’s leg had been hurting but he and his doctors could not figure out why. When an MRI in his home town of Boulder indicated something wasn’t right, which a biopsy later confirmed, Phil was referred to orthopedic oncologist Dr. Cynthia Kelly of the Colorado Limb Consultants in Denver. 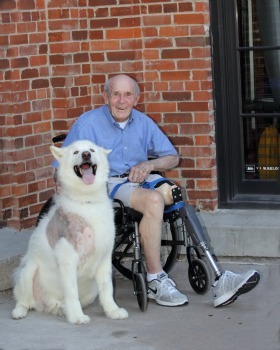 After trying several surgical procedures to save his leg, Phil made the brave choice to move forward with an above knee amputation. Throughout his treatment, Phil had great support from his family, his church (Mountain View United Methodist) and his medical team. He is very grateful to Dr. Kelly, as well as to physiatrist, Dr. Noel So, and prosthetist, Zach Harvey with Creative Technology OPS. 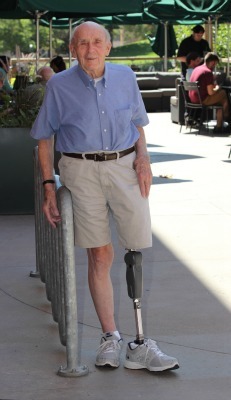 Phil looks forward to moving better with his prosthesis so that he can continue flying radio controlled model aircrafts, a love he has had since eight years of age. He also looks forward to being able to walk the nature trails around Boulder! In the meantime, he has his volunteer work to keep him busy! Phil finds volunteering deeply rewarding and has served at Hospice Boulder and the Boulder Community Food Share. 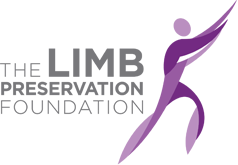 The Limb Preservation Foundation is privileged to have supported Phil in his recovery through the funding of research in the area of limb-preservation. Is that a dog or a polar bear? You might have to do a double take when you see Dancer for the first time! This seven-year-old Malamute was diagnosed with osteosarcoma in his right front leg in December of 2014. Because of Dancer’s size, his mom elected to do a limb-salvage procedure instead of an amputation, in addition to chemotherapy. This treatment has seemed to work well for Dancer, who continues to love being the center of attention. In fact, Dancer shared his life moto with us during our photoshoot: “My job is to be adorable and your job is to adore me!” Well, Dancer, it’s hard not to!